Chess databases & chess playing software have been steadily evolving over the past few decades & there are now several low cost or free options that are quite high quality. I'm not going to presume to make judgements about which play engine is stronger or "better" or even which database is bigger, partly because some of these parameters are subjective & partly because they're constantly changing. That same rationale would apply to online playing sites & to chess news outlets as well. Certainly some play sites will appeal to some people more than others for differing individual reasons & likewise some people may prefer the style or scope of news coverage provided by one news site over another for widely varying reasons. My intention is to list most of the major entities in each of these sectors & provide a brief description of what to expect. Eventually more specific details may be included, such as engine/database installation guidelines, or special notes about upcoming news events. Ideally, comments here will focus on providing general useful information particularly for those less familiar with the finer details complexities of these products & services. My purpose is to be inclusive rather than judgemental, so for the most part reader feedback is welcome. Most of the major internationational tournaments & matches are covered by every news outlet, so selecting one or more of them becomes a matter of deciding whose style, presentation or depth you prefer. ChessVibes Daily puzzle, Live ratings, Videos, Blog, etc. In November 2010 she was ranked as the fifth-highest Girl in the world. WIM (2005); WGM (2007); IM (2008). 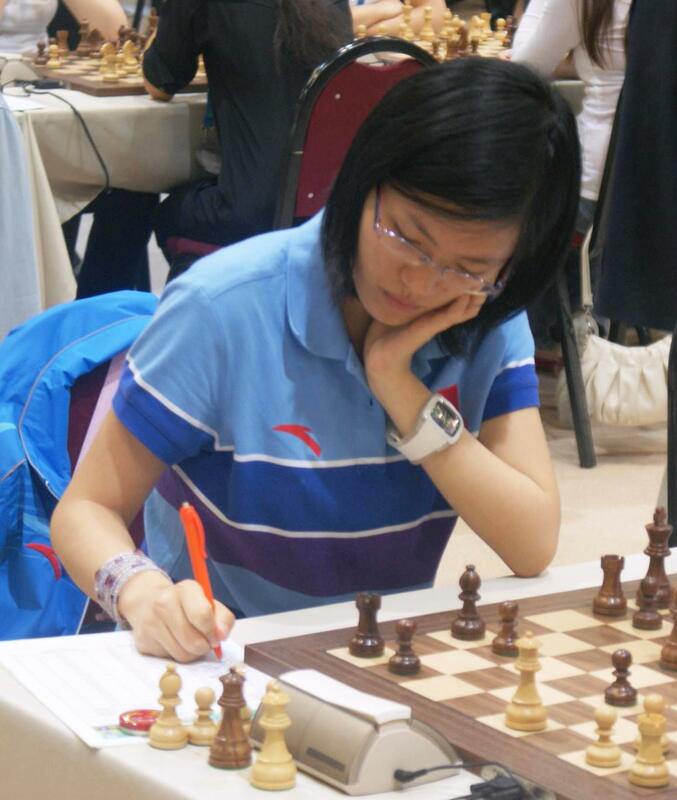 Was granted the title of Grandmaster by winning the 2015 Women's World Chess Championship. 15th Women's World Chess Champion. Born September 21, 1992 (age 22). 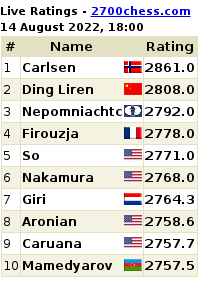 Currently ranked #12 woman in the world with a FIDE rating of 2526. Her sister, Anna is currently ranked #6 woman in the world with a FIDE rating of 2552. Finished Equal First in Ukrainian Women's Championship 2012 @ 6.5 & won on tie breaks. 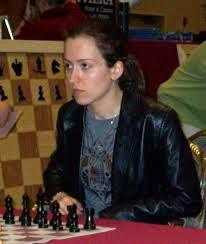 Won the U.S. Women's Chess Championship 1998 at age 14 to become the youngest ever to do so. Suggested a novelty on move 10 in the "Kasparov versus the World" chess competition in 1999. Played first board on the bronze medal winning U.S. Women's team in the 38th Chess Olympiad, 2008. Won the U.S. Women's Championship on five other occasions: 2007, 2010, 2012, 2013 & 2014. 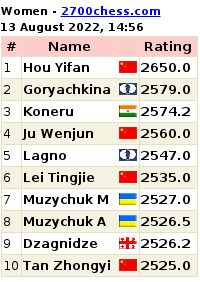 Earned FIDE GM title in 2013. Currently plays for the New York Knights in the U.S. Chess League. Youngest girl ever to beat a grandmaster in USCF rated play, 2014. Finished 4th at World Youth Chess Championship Girls U10, UAE, 2013. First & only female ever to win WCC Championship in 55 years. Youngest person, at age 10, ever to win WCC Championship in 55 years. 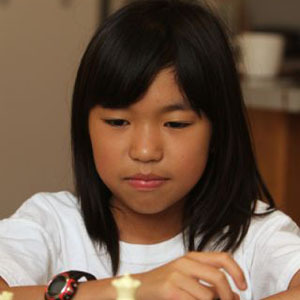 Won her first Chinese Women's Chess Championship at age 13, June 2007. First GM norm, Aeroflot Open, Moscow, February 2008. GM title, August 2008 at the age of 14 years 6 months 2 days. Won the Women's World Chess Championship, December 2010 in Hatay, Turkey. Youngest women's world champion in history. Successfully defended her Women's World Champion title, November 2011. Knocked out in the 2nd round of the Women's World Chess Championship, November 2012. Regained her Women's World Championship title, September 2013. Scheduled to play in the Hawaii Grandmaster Challenge in March 2015. Since this conflicts with the Women's World Chess Championship 2015 (knock-out) she will be relinquishing her title at the conclusion of that event. Having won the FIDE Grand Prix 2014 has qualified to challenge world champion Mariya Muzychuk to a ten-game World Championship match in the third quarter of 2015. Finished 9th at World Juniors Girls Puerto Madryn, Argentina, November, 2009. Earned FIDE WIM title in 2010. Ranked 45th on FIDE Top 100 Girls 2013. Class of 2016, MIT Electrical Engineering & Computer Science. Natalia Pogoninia = WGM Pogonina's home page of bronze medal winner at the X Women European Chess Championship! Here's a list of some short Biographies of women in 2014 US Women's Championship. PhysOrg.com article attributing the low incidence of women at the highest levels in chess to a direct result of their much lower participation rate rather than to innate biological differences. ♚House of Staunton High(est) Quality Chess Sets: Wood, Mesta, Plastic, etc. Comments Junkie Sets, Boards, Pieces, Clocks, Videos, & accessories for sale online. American Chess Equipment Sets, Boards, Clocks, Videos, Books, etc. ♞The Chess House Sets, Boards, Clocks, Videos, Books, etc. Chess USA Sets, Boards, Clocks, Videos, Books, etc. ♗The Chess Store Sets, Boards, Clocks, Videos, etc. ♔USCF Sales Sets, Boards, Clocks, Videos, etc. ♘Wholesale Chess Sets, Boards, Clocks, Videos, Trophies, Tables, T-Shirts, etc. ♘Chess Bazar Nice Wooden & Bone Sets, Boards, etc. At a price less than $5 above the original cost of the silicone boards, these are destined to become the latest craze! James, the rookie wood turner, using alder & walnut woods manufactures his own chess set the old fashion way, one piece at a time. ♕Online PGN Editor - for entering games into PGN format to save or send here for publication. Host Hotel at Cedar Lake, 366 Main St, Sturbridge MA 01566 (I-84 Exit 3, near I-90), near the Connecticut border. Free parking. Master Section is FIDE rated. Master (2200/up): $2000-1000-500-300, clear winner or 1st on tiebreak $100 bonus, top U2300 $800-400. Class E (Under 1200/Unr): $600-300-200-100. Unrated may enter E through A, with prize limits: E $100, D $200, C $300, or B $400. Mixed doubles bonus prizes: best male/female 2-player "team" combined score among all sections: $600-300. Team average must be under 2200; teammates may play in different sections; teams must register (no extra fee) by 2 pm 4/6. Top 5 sections entry fee: $115 online at chessaction.com by 4/3, 3-day $118, 2-day $117 if check mailed by 3/26, $130 at site, or online until 2 hours before round1. GMs free, $100 deducted from prize. Class D or E Section entry fee: All $50 less than top 5 sections entry fee. Online entry fee $5 less to MACA members; may join/renew at masschess.org. No checks at site, credit cards OK. No credit card mailed entries. 3-day schedule: Reg ends Fri 6 pm, rounds Fri 7 pm, Sat 11 am & 5 pm, Sun 10 am & 3:30 pm. 2-day schedule: Reg ends Sat 10 am, rounds Sat 11 am, 2 pm & 5 pm, Sun 10 am & 3:30 pm. Byes: OK all, limit 2 byes; Master Section must commit before round 2, others before round 3. 3 Round Swiss, G/60;d5 Affects both quick and regular rating. Round Times: 10:30, 1:30, 3:45. Entry Fees: $30 Cash Only. WORLD AMATEUR TEAM & U.S. TEAM EAST. 6SS, 40/2, SD/30 delay 5. Parsippany Hilton 1 Hilton Ct., Parsippany,N.J. 07054. Chess Rate valid until 1/17. Reserve early 973-267-7373 or 1- 800-HILTONS. Morris/Essex train to Morris Plains 1.5 miles. Open to 4- player teams with one optional alternate. Team average (4 highest ratings-2019 January Rating list) must be under 2200. EF: $199 postmarked by 2/5/19. ALL-$240 after or at door. - all teams, any changes at site $25 charge. ENTRY MAXIMUM IS 325 TEAMS. Enter early! Check out official website www.njscf.org. All 6-0 scores each Digital clock. Sunday night: Best "Chess Related costumes or gimmick"
1st-gourmet dinner for four, 2nd-Gourmet dinner for 4. Reg. 9-12 Sat 2/16: Rds. 1-7:30, 11-6, 9-3:30. Surprises and special give-aways each round. Sunday night - Bughouse $20 per team. Cash prizes. HR: Parsippany Hilton NEWLY RENOVATED! NEW LIGHTS! HEATING AND AIR CONDITIONING! 2nd hotel attached to Hilton $130 per night (single-double) $132 (triple, Quad) - Hampton Inn includes breakfast each day. For help forming teams and more information contact: noreenchess@gmail.com. Chks payable to NJSCF, mail by 2/05/19 to: NJSCF, 17 Stonehenge Road, Morristown, NJ 07960. (Include Team name, Captain, players full names, USCF Expiration, ID numbers and ratings in board order). Play chess against an international master! David Vigorito will give a simultaneous exhibition, playing multiple opponents at one time. Limited to 30 players; others can watch-quietly please! Observers need not register. Bring your own chess set. For ages 12 and up. Snow date: January 26. Scroll to the bottom of the NH chess website, http://nhchess.org/ for details. $160-1st, $80-2nd. (Top 2 Prizes Guaranteed.) Top U1600 wins $30 in EF Credit when 12+ players. 3 Round Swiss, G/60;d5, [Dual rated] Affects both quick and regular rating. Round Times: 10:30, 1:30, 3:45. $30 Cash Only. Register On-site Only: 9:45 am - 10:10 am. Best Western Royal Plaza Hotel, 181 Boston Post Rd. West, Marlboro, MA. 4 round Swiss. G/60, d5; Rounds at 10 a.m., 1 p.m., 3:30 p.m., 6 p.m. Unrated can't win more than $75 in U1200, $125 in U1600, $150 in U1900, $200 in U2100. Unpublished uschess.org ratings usually used if otherwise unrated. Entry Fee: $39 if mailed by 10/23 or online by 10/26, $45 at site. GMs and IMs free. $10 discount for U1200 section. Registration - Online: Available till 10/27/2018 12:00:00 AM. Bob Messenger 603-891-2484. Day of the tournament call 603-557-1732. 4SS, 40/90, SD/30 + 30 Sec. Increment. EF: $70 (postmarked by 16 June). $80 after 16 June and at site. Reg: 8:30-9:30 AM on Saturday. Rds: 10-4, 10-4. One 1/2 point bye rounds 1-3, limit 1. ENT: Alex Relyea, 49 Technology Dr. #89, Bedford, NH 03110. INFO: Email Alex Relyea relyea@operamail.com. Web Site www.relyeachess.com. Unrated can't win more than $50 in U1310, $75 in U1710 or $100 in U1910., Unofficial uschess.org ratings usually used if otherwise unrated. EF: $39 if mailed by 12/5 or online by 12/8, $45 at site. $20 discount to players in U1310 section. GMs and IMs free. Reg: 8:30 to 9:30 a.m. Rds: 10 a.m., 1 p.m., 3:30 p.m., 6 p.m. One 1/2 point bye rounds 1-3. Bob Messenger 603-891-2484. Day of the tournament call 603-557-1732. No phone entries. DOB MUST be included with entry. Open to players born before 22 Oct 1967. EF: $50 postmarked by 14 Oct. $55 at site. $$GTD: $300-200. 50-54 $100, 55-59 $100, 60-64 $100, 65-69 $100, 70-74 $100, 75+ $100. Ages as of 22 Oct. $100 bonus and plaque to top New Hampshire resident. Reg: 9-9:45. Rds: 10-4, 10-4. One 1/2 point bye rounds 1-3. HR: $119, 603-641-4900, mention Relyea Chess. NS W.
4SS, G/60 d5. Rounds: 10-1:00-3:30-6:00. Championship, U2100 or Unr. EF: $37 if rec'd by 11/2, $42 at site. $$G: $180-120-60; trophies to top 2, top 2 U1850. Intermediate, U1750 or Unr. EF: $37 if rec'd by 11/2, $42 at site. $$G: $130-80-50; trophies to top 2, top 2 U1500. Novice, U1350 or Unr. EF: $31 ($26 to jrs. U21) if rec'd by 11/2, $36 at site ($31 jrs. U21). Trophies to top 3, top 2 U1100. All, NHCA membership req'd of rated NH residents; dues $8 adult, $6 under 19. Reg: 8:30-9:35am Sat. 11/4, Rds: 10-1:00-3:30-6:00. Bye: All Rds. (except no final Rd. bye in top section), limit 1, must commit before Rd. 2. No half-point byes for players receiving full-point byes. Online advance entry available until 11/3 at 6 PM. Ent: NHCA, c/o Hal Terrie, 377 Huse Rd. #23, Manchester, NH 03103. Info: halterrie@comcast.net; no phone calls. Entry Fee: $39 if mailed by 10/10 or online by 10/13, $45 at site. GMs and IMs free. $10 discount for U1200 section. Open to players born before 9/18/1967. 4 round Swiss. 40/100, SD/60; d5; Round times Sat. 10 am and 3 pm. Sun. 10 am and 3 pm. $1,100 based on 30 fully paid entries ($20 off entries count 60%). 80% guaranteed. Unrated can't win more than $100 in U1810 section. The 86th Massachusetts Open at Best Western Royal Plaza Hotel, 181 Boston Post Rd. West, Marlboro, MA. You can play as a 2-day or 3-day event & compete for several thousand dollars in prizes. 6 round Swiss. 40/100, SD/60; d5. 2-day schedule rounds 1-3 are G/45; d5. 80 Grand Prix Points. Entry: chessaction.com or Continental Chess, Box 8482, Pelham NY 10803. Questions: DirectorAtChess.us, chesstour.com, chesstour.info, 347-201-2269. Entries posted at chessaction.com (online entries posted instantly). $15 service charge for refunds. The tournament will be unrated, so USCF memberships are not required. Food will be provided. Have fun, and hope to see you there! ♝ The new site is Middlebury Recreation Center, 154 Creek Road, Middlebury, VT. It is less than half a mile from the hotel site that is advertised in the November issue of Chess Life. ♕ Four sections: Open, Under 1910, Under 1610 and Under 1310, with additional prizes for the top players rated under 2110, under 1760, under 1460, under 1100, under 900 and unrated. ♞ The advance entry fee is $39, with a $20 discount to players in the Under 1310 section. ♙ Rounds at 10 a.m., 1 p.m., 3:30 p.m., 6 p.m.
♜ "... shot between 2004 and 2014 follows a child prodigy who has become a chess champion." "A new documentary premiering at the Tribeca Film Festival in New York on April 14th tells the story of Magnus Carlsen's ascent to the top of the chess world. The film aims to go beyond the basic history that will be familiar to chess fans and to show us the thoughts and emotions of the Norwegian star. To do so, the director Benjamin Ree was given unprecedented access to Magnus in the lead-up to the Chennai World Championship in 2013 and during the match itself. But the story goes back all the way to Carlsen's childhood, with priceless footage from his youth." ♜ registration is 8:30-9:30am in the cafeteria (in the Administration Building) the first round starts 10:00am. ♙ Entry fee is $5 per person; players are asked to bring chess boards, pieces, and chess clocks if possible. ♞ Prof. Joe Alfano (Assumption College) is tournament director. Holiday Inn, 9 Northeastern Blvd. (exit 4 off Everett Tnpk/Rte. 3), Nashua, NH. trophies to top 3, top 3 U1850. trophies to top 3, top 3 U1500. ♘ Novice, open to U1300 or Unr. EF: $30 ($25 to jrs. U21) if rec'd by 11/3, $35 at site ($30 jrs. U21). Trophies to top 3, top 3 U1100. Reg: 8:30-9:35am Sat. 11/5, Rds: 10-1:00-3:30-6:00. Bye: All Rds. (except Rd. 4 in Championship section), limit 1, must commit before Rd. 2. No half-point byes for players receiving full-point byes. Online advance entry available at www.nhchess.org until 11/4 6 PM. Ent: NHCA, c/o Hal Terrie, 377 Huse Rd. #23, Manchester, NH 03103. Info: halterrie@comcast.net or (603) 668-8368. Entry Fee: $39 if mailed by 10/25 or online by 10/28, $45 at site. GMs and IMs free. $10 discount for U1200 section. Host Hotel at Cedar Lake, 366 Main St (Rt 20 West), Sturbridge MA 01566 (I-84 Exit 3, near I-90). Mixed doubles bonus prizes: best male/female 2-player "team" combined score among all sections: $1000-600-400. teams including an unrated cannot win over $300. balance goes to next player(s) in line. or online until 2 hours before round 1. GMs free; $150 deducted from prize. All: Online EF $5 less to MACA members; may join/renew at masschess.org. Re-entry $80; not available in Open. Unofficial uschess.org ratings usually used if otherwise unrated. ♘ The Keene Open will be held on Saturday, June 18th. ♔ Open, $$ 150-100, U1900 75. ♜ U1750, $$ 100-50, U1550 25. All, EF: $35 if rec'd by 6/1 or $42 at site. Souvenir T-shirt to every advance entrant; indicate size (S,M,L,XL,XXL). Reg. : 8:30-9:30 a.m., Rds. : 10-12:30-3-5:15. 1/2-pt. bye okay, limit 2, must commit before round 3. No Unr may win over $50 except in Open. Ent: David Thomas, PO Box 7582, Fitchburg, MA 01420-7582; 508-904-3476. The 85th Massachusetts Open at Best Western Royal Plaza Hotel, 181 Boston Post Rd. West, Marlboro, MA. Stratton Student Center, 84 Massachusetts Avenue, Cambridge, MA 02139 (MIT campus, near Kendall red line stop). 4SS, G/60 d5. $$600 b/30 paid entries, $450 minimum (60% each prize). 3 sections: Open: $200 - $100 U1800: $120 - $60 U1400: $80 - $40. EF: $25, $30 on-site. $10 off to current MIT students w/ID. Advance entries: http://goo.gl/forms/Qo1MZ1CWmz Registration: 9-10:00 AM. Rounds: 10, 12:30, 3:30, 6. Entry./Info. : http://goo.gl/forms/Qo1MZ1CWmz. Questions to chess-club-owner@mit.edu. Filling out this form constitutes advance registration; bring payment on day of tournament. Parking highly unlikely to be available; please plan on alternate transportation. Playing site is located at Lobdell dining hall (second floor of the Stratton Student Center) a ~10 minute walk from Kendall red line stop. Navigate to building W20 (Stratton Student Center) and follow signs/volunteers to tournament. Minors may be required to have parents sign a waiver at registration. ♞ There will soon be an Official Wachusett Chess Club Flyer graced by the now legendary "Barlas Knight". At the moment it's still a work in progress, but feel free to print it out & post it anywhere you like. ♜ Jan 8-10 or 9-10, 2016 4th Annual Boston Chess Congress 5SS, 40/110, SD/30, d10 (2-day option, rds 1-2 G/60, d10). (I-495, exit 24B, Rt. 20W, one mile from exit). Visit the CCA site to view Crosstables & standings for each section as results become available. ♔ Tuesday, December 8: Larry Christiansen Simul at South Station 25 boards, noon to 2:00 PM. Open seating until 1:15pm. No fee. ♟ There's apparently a new movie about the Bobby Fischer story coming out soon. "Трейлер невероятного кино про лучшего шахматиста всех времен - Бобби Фишера, злых русских и паранойю - Жертвуя пешкой / Pawn Sacrifice." Based on this review, it looks like it'll be a pretty good movie, which is a difficult task for a chess related movie. Here's the schedule for showings at the Kendall Square Cinema. ♕ Relyea Chess sponsors a WIM Norm Tournament on Thursday-Monday, 19-23 November 2015 at Homewood Suites, Manchester, NH. Ten (10) round event! Six (6) player double round robin. ♖ Maximillian Lu, a 10-year old Whitby School student & Connecticut resident, seen here at the Greenwich Time, Friday, Oct. 2, 2015, has become the youngest chess player to earn the master rating in U.S. Chess Federation history. Max accomplished this by scoring two wins & a loss in the BPCC September Action Quads in Scarsdale, NY on September 2nd of this year (28 days before his tenth birthday). Congratulations Max! 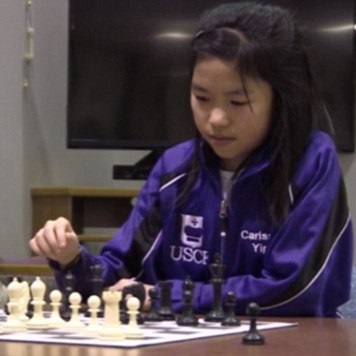 ♕ Since Carissa Yip's picture is on the current issue of Chess Life, the USCF announcement of Max's achievement on Twitter was graced with a picture of Carissa! How cool is that? ♔ MACA President, Nathan Smolensky, is featured in this local news story. ♔ Massachusetts resident & 2013 Mass Open Champ, Mika Brattain is competing in this year's US Junior Closed Championship. You can view the games live & in .PGN here. ♕ 2014 WCC Champ, Carissa Yip's game against Annie Wang at the U.S. Girls Junior Championship (Closed) June 22-26 was featured in an article by GM Gregory Serper on Chess.com. Here GM Serper compares Carissa's playing style to that of former World Champion, Mikhail Tal! ♗ Saturday, October 18, 2015 82nd Greater Boston Open 4SS, G/60 d5. Info: email to info@masschess.org or phone 603-891-2484. Day of the tournament phone 603-557-1732. ♔ Tuesday, November 10: Larry Christiansen Simul at South Station 25 boards, noon to 2:00 PM. Open seating until 1:15pm. No fee. ♔ Tuesday, October 13: Larry Christiansen Simul at South Station 25 boards, noon to 2:00 PM. Open seating until 1:15pm. No fee. ♔ Gary Kasparov, bestselling author, and chairman of the Human Rights Foundation, will be at the First Parish Church 1446 Mass Ave, Harvard Square, Cambridge this Sunday, November 1 @ 7:00 PM. "Winter Is Coming: Why Vladimir Putin and the Enemies of the Free World Must Be Stopped"
presented by the Harvard Book Store. Tickets $5. the USA Youth Chess Team in the 2015 Girls under 12 Section. After four rounds, Carissa is one of four leaders with four points! The tournament crosstable shows results after each round & next pairing. According to the USCF, it's now "more official". ♔ Tuesday, September 8: Larry Christiansen Simul at South Station 25 boards, noon to 2:00 PM. Open seating until 1:15pm. No fee. The 75th New England Open at Holiday Inn Boxborough, 242 Adams Place, Boxborough, MA 01719. 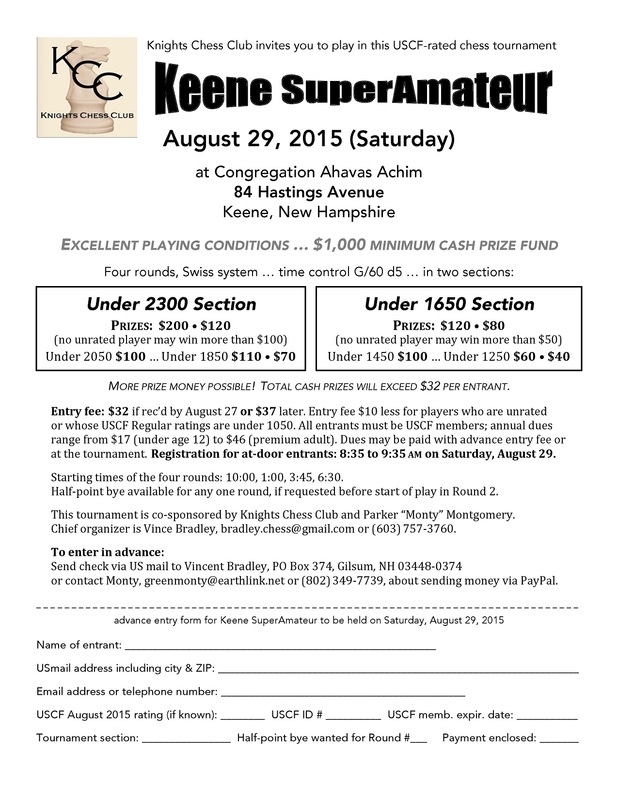 ♘ This upcoming Saturday, August 29th, the Keene Super Amatueur Chess Tournament in Keene, NH. or through email and directly Bradley.Chess@gmail.com via Paypal. ♖ This weekend, August 14-16, includes the 45th Continental Open in Sturbridge. It also happens to be the 46th anniversary of the Woodstock Music Festival ♫. ♟ Note: The Andover Chess Club will be in recess for the rest of the summer and they will need to find a new location. ♔ Tuesday, August 11: Larry Christiansen Simul at South Station 25 boards, noon to 2:00 PM. Open seating until 1:15pm. No fee. ♔ The Waltham Chess Club will be present GM Timur Gareev to do a Blindfold 10-Player Simul [or lecture] on Friday, August 07, 2015. Players will vote on their choice of event that night. Cost is $10 & it's "Free Pizza Night." ♔ If you like Shakespeare &/or want to see WCC member, Arthur Barlas, play the part of a merchant, head over to the Concord Public Library this weekend at 5:30 PM Saturday & Sunday (August 1st & 2nd) for The Concord Players' production of "The Comedy Of Errors". It's free & if it's raining they'll do it indoors @ 51 Walden Street, Concord, MA. ♔ Tuesday, July 14: Larry Christiansen Simul at South Station 25 boards, noon to 2:00 PM. Open seating until 1:15pm. No fee. Last year's winner, WCM Claudia Munoz will not be defending her title due to other commitments. To watch the games live & track the tournament, you can go to Monroi.com at:http://monroi.com/chess-games.html. You'll have to crete a login ID to see the games, but it's free. The USCF has some details about this event at:All Girls US Junior, Tulsa. You can take a look at Carissa's first round victory against WFM Sarah Chiang here. ♘ TIME SENSITIVE announcement regarding Mike Beatini on the Announcements page of the KCC website, with your responses needed almost immediately, RSVP. ♔ Tuesday, June 16: Larry Christiansen Simul at South Station 25 boards, noon to 2:00 PM. Open seating until 1:15pm. No fee. ♔ Tuesday, June 9: Larry Christiansen Simul at South Station 25 boards, noon to 2:00 PM. Open seating until 1:15pm. No fee. ♘ Danila Poliannikov of Massachusetts finished tied fourth-ninth place with a 6-1 score at the K-5 National Elementary Championships completed on May 10th in Nashvillee TN. ♔ Tuesday, May 12: Larry Christiansen Simul at South Station 25 boards, noon to 2:00 PM. Open seating until 1:15pm. No fee.